Now that the weather is finally getting nice I've been spending more and more time working on outdoor projects. 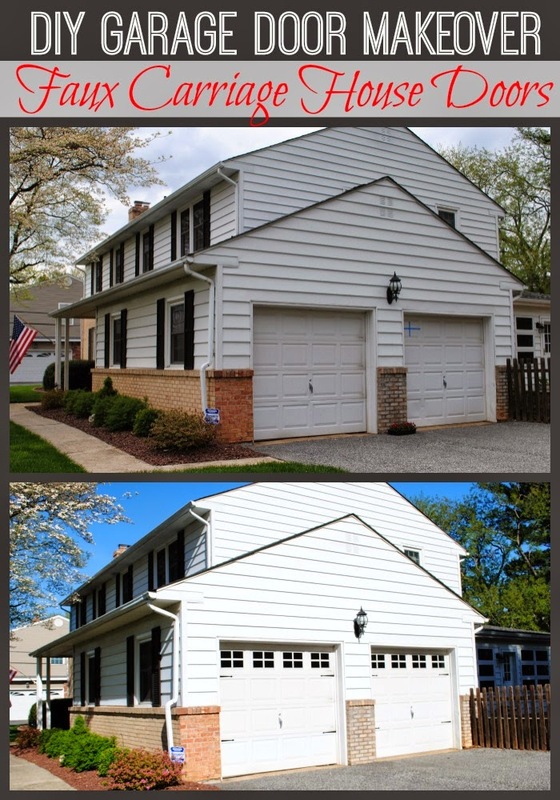 Over the last week my focus obsession has been on giving my garage doors - yes, the garage doors - a makeover. The things you never thought you'd say. 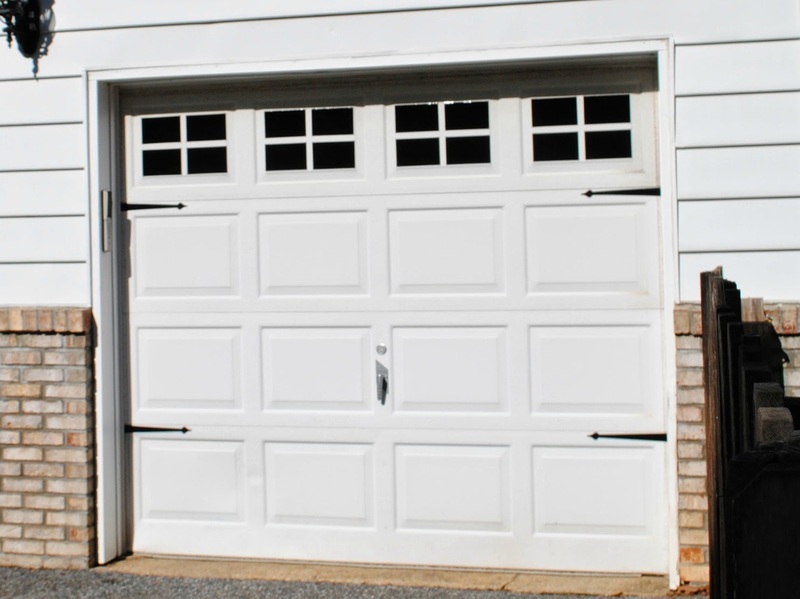 There wasn't anything really wrong with the garage doors, I just thought they'd look a little nicer - add some curb appeal - with a makeover. 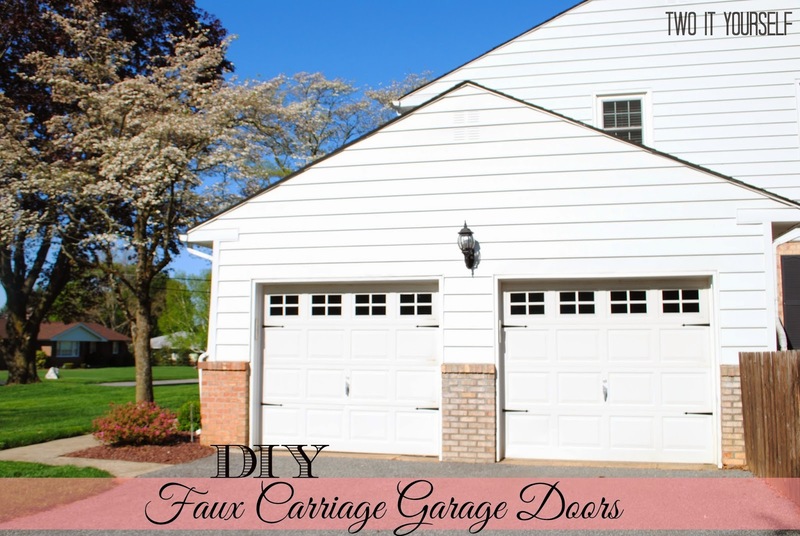 I like the look of carriage house garage doors so I set out to find a way to do it myself. While the hardware kits for the brackets and handles (I did not use handles) aren't terribly expensive, installing the windows can be pricey especially if you have double doors. I found a way to spend very little money - for both! 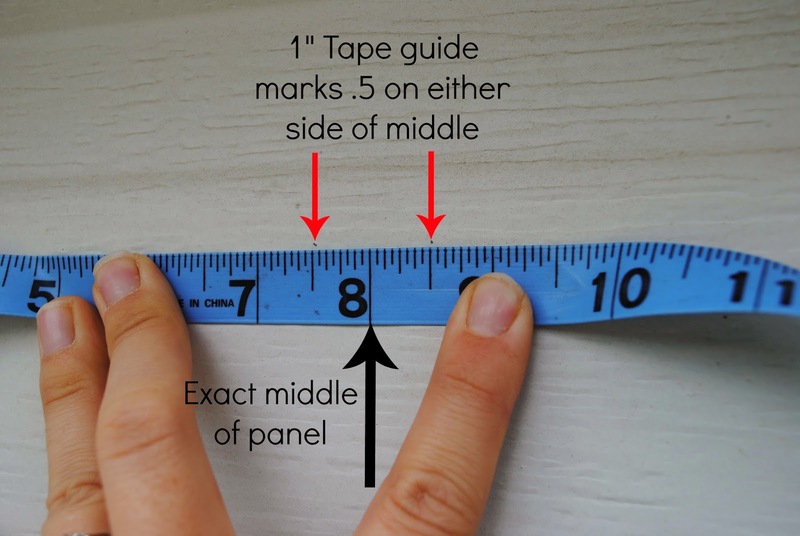 The first thing I did was measure the individual panels on my garage door just so I knew what I was working with. Each panel measured 16" x 10.5". I then decided on the style of windows that I wanted. 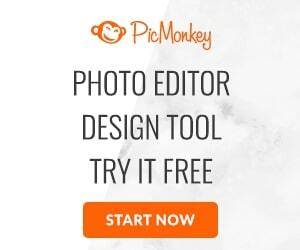 There are so many different options and since you're DIYing you can really pick your favorite. I decided to go with quarter panels on each "window." Now it's time to tape off your design. I used 1" 3M Scotch Blue Painters Tape to make the cross between the panes. Since my panels are 16" across, I made two pencil marks each at .5" on either side of the 8" (middle) point. I made the two marks an inch apart so the middle of my painters tape was exactly in the middle. I actually made two sets of marks: one at the top of the pane and another set at the bottom of the pane. I did this to ensure the tape was straight which would ensure my window panes were all exactly evenly spaced. I repeated this measuring process for the height mark as well at 4.75" and 5.75" (5.25" was my middle point). 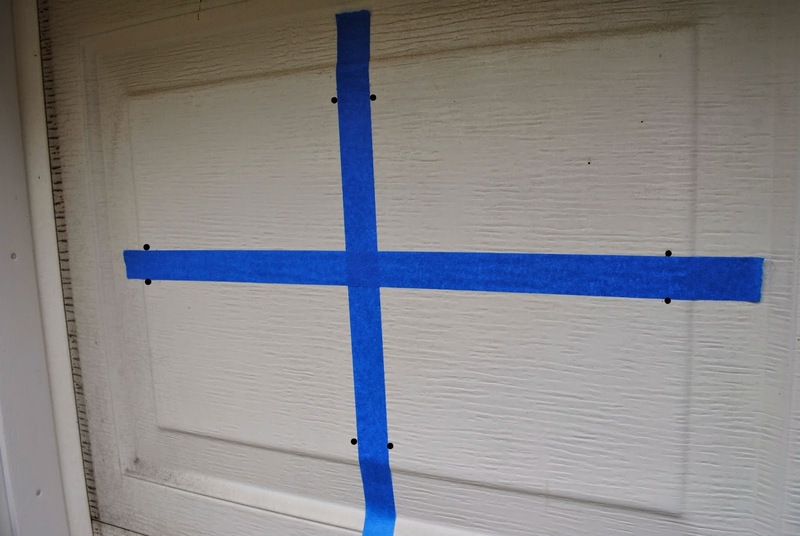 With the painters tape cross guide up, it's time to install your window panes. I know this may sound confusing...but hopefully this picture will help. My pencil marks are highlighted by the black dots. I like the vinyl option because it can be removed, unlike paint. While it is removable, using outdoor permanent adhesive vinyl, ensures the windows hold up and are not 'easily' removable due to things like weather and wear. 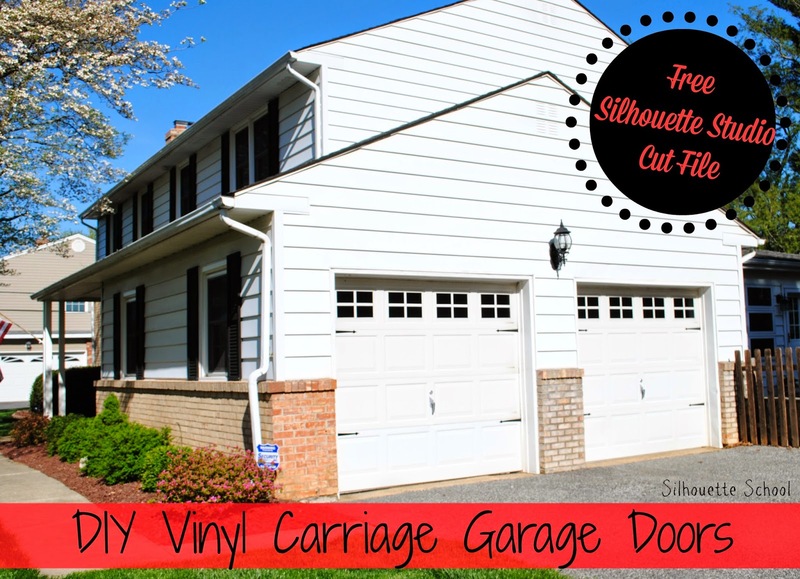 However, I know paint is a much more likely supply in your tool belt than a die cut machine....so if you don't have a vinyl cutter you can actually paint the windows and hardware directly onto your garage door. A Pinterest Addict Blog did a similar project using paint and recommends Sherwin Williams All Surface Enamel in Satin Finish - Tricorn Black to paint the windows. After applying the window panes, remove the tape and then repeat the process for all the windows. Once I was finished with the windows I moved on to adding the hardware. For me, it was just a matter of cutting out another piece of vinyl in the shape of a bracket. 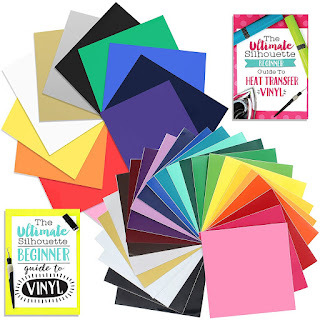 If you are painting, my suggestion would be to cut a stencil using contact paper where you will get a tight seal to avoid paint leaking under the stencil. And that's how I transformed my garage door in less than two hours and for not very much money! 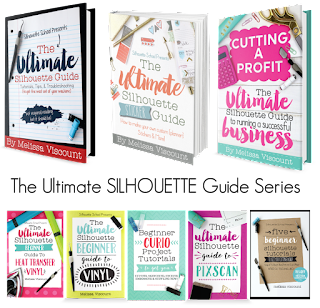 If you're a Silhouette owner, enter our giveaway to win a $25 gift card to Expressions Vinyl. 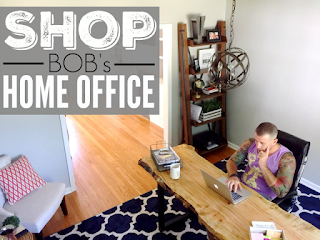 Get everything you need to make this garage makeover possible...or use it to buy whatever you have your heart set on! 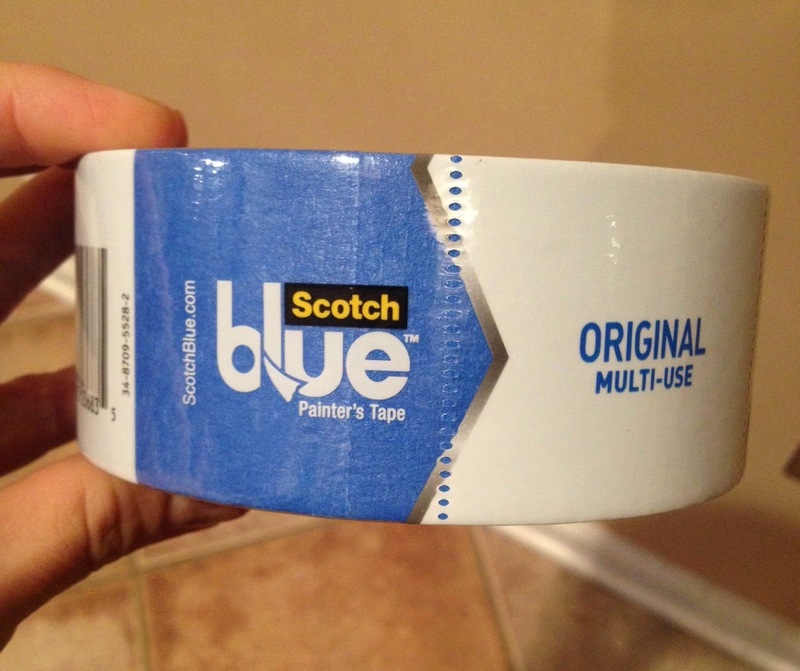 Disclaimer: I received samples of 3M Scotch Blue Painters Tape and Oracal 651 Vinyl from Expression Vinyl for this project, but all opinions are my own.